The relatively small area of the room has not become an obstacle to create stylish Interior and functional space of the bedroom. The Classic decor has become the basis for arranging the space and decoration. The decorative elements are used with great clarity. Therefore, the composition catches the eye. 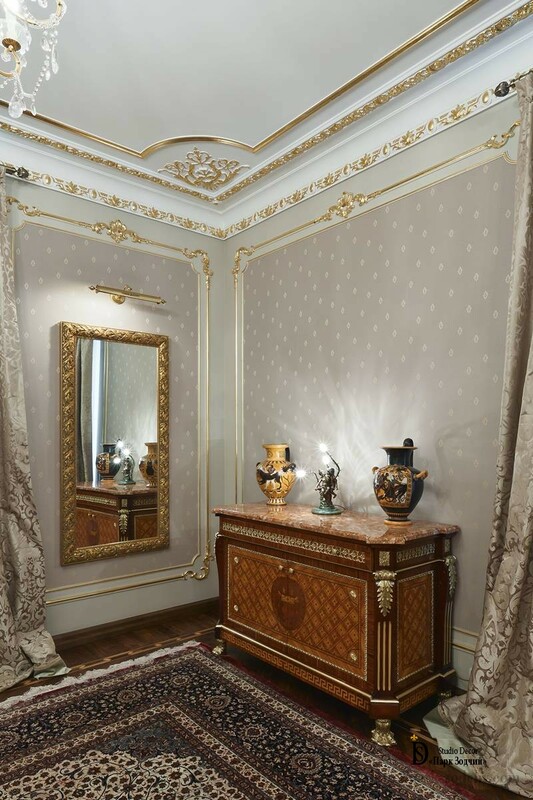 Architectural mirrors, framed with well-crafted gilded stucco moldings, are those uniting various interior parts: pictures, mirror, upholstered furniture for sitting area, bedside chests. On the wall near the bed, it has been decided to abandon stucco molding, so as not to distract from the carved headboard, bedside tables and exquisite lamps. The rather narrow niche has been chosen as a decorative element. As a result, it has been got the composition that attracts the eye. The color of the portieres is in harmony with the coverlet of the bed, wall decor, thus diluting the complex color solution. It has been succeeded to place the sitting area and a dressing table in the room. The mirror with soft contour lines adds a certain charm to the room. The large carpet combines two color lines. In fact, different areas are bound to it: areas of sleeping, sitting, for make-up. It also provides flow of colors from the upholstery to the walls. Details set the tone for the entire space. The interesting compositional solutions integrate the entire room. Marble of the countertops of the bedside tables, the bedside chests, the tea and dressing tables. The pattern of the furniture echoes with the décor of the night lamps. The wooden elements, covered with gold leaf, also perform this task. 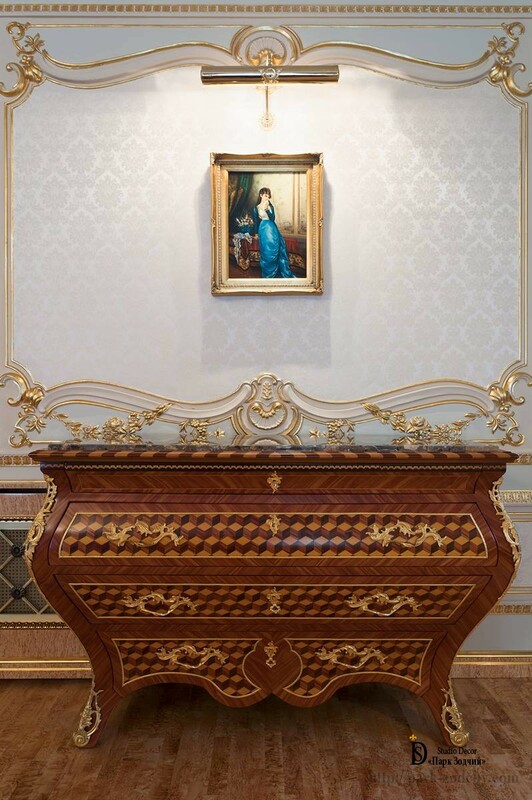 The chest combines marble, inlaid wood pattern, gilded items. 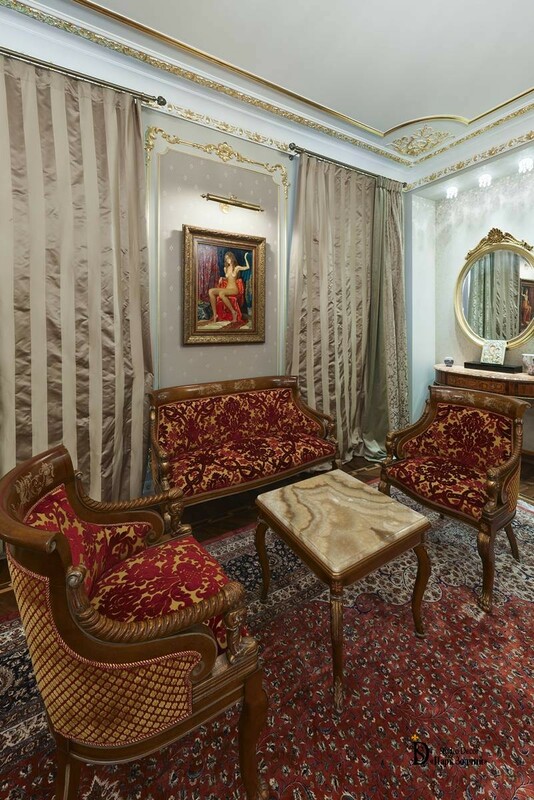 Design of the fine-worked stucco moldings has allowed creating for it a magnificent backdrop. The backlighting of pictures serves to focus attention on the iconic items of the Interior: the bed, the pictures and the bedside chest. The spot ceiling lights change the view of the true size of the premises. The pendants of light fixtures harmoniously complement the excellent, but even so light, translucent chandelier. It, in turn, does not overload the ceiling with massive details. Backlighting of small niches, located at the opposite sides of the room completes the depth perspective. An interesting feature of the decoration is the fact that the various fixtures make the tone of the Interior warm or cold. The chandelier highlights the bedspreads, the center of the bed carpet and material of the upholstery furniture. The side lighting focuses attention on the walls and the dimmed blue color of the carpet. 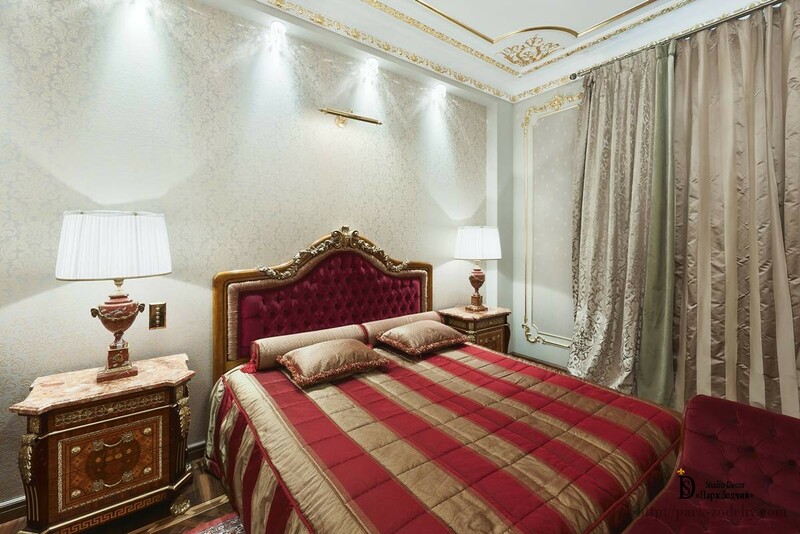 The bedroom in the Classic style is complemented by vases, decorative elements which support blue-golden palette. The details have combined the space into coherent whole, as part of a sophisticated puzzle.